The present report describes an acute subdural hematoma (ASDH) associated with subarachnoid hemorrhage (SAH), due to ruptured cortical aneurysm. To our knowledge, extremely rare cases of this sort have been reported so far. A 23-year-old male patient without previous trauma presented with severe headache and rapidly decreasing level of consciousness to decerebrate status. Computed tomography (CT) scan has demonstrated an ASDH together with SAH. Hematoma has immediately been evacuated without any evaluation by angiography. After evacuation of the thick subdural clot, a 10-mm aneurysm was revealed on a precentral artery of frontal cortex, which was ligated. However, after 35 days the patient discharged with left side hemiparesis and dysphasia, and just after several months of admission he got symptom free. Ruptured cortical aneurysm should be considered as one of the causes of spontaneous ASDH. Vascular anomaly investigations are suggested for these cases, thus CT angiography or digital subtraction angiography has to be considered if clinical condition allows. Spontaneous or nontraumatic acute subdural hematoma (ASDH) is very rare. Aneurysmal rupture, rupture of perisylvian arteries and tumors has been considered as the main causes. Raptured aneurysms is usually associated with either subarachnoid hemorrhage (SAH) or intracranial hemorrhage (ICH). The report involves a case of extremely rare presence of spontaneous ASDH associated with SAH caused by a ruptured cortical artery aneurysm. The awareness of such a case is crucial due to the vital urgent diagnostic procedures and therapeutic strategies that have to be taken. Ruptured aneurysms are usually associated with either SAH or ICH. ASDH due to ruptured intracranial aneurysm is very rare. Knowledge of this uncommon presentation is crucial because it requires immediate diagnostic procedures and treatment. We report a case of spontaneous ASDH and SAH caused by a ruptured cortical artery aneurysm. A 23-year-old man presented with sudden onset severe headache to a peripheral hospital followed by reduction of the level of consciousness. There was no history of trauma. His history indicated a minor psychological problem that was under medical treatment. Because of progressive reduction of the level of consciousness, he has been referred to our hospital for further investigation and treatment. When he reached our emergency ward, he was in a deep coma (decerebrate rigidity). The right pupil was dilated, and the left one was myotic. The patient had central neurogenic hyperventilation. 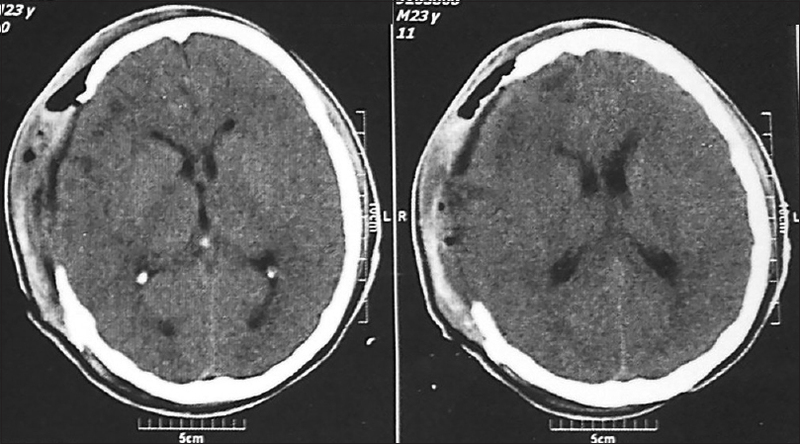 He underwent brain computed tomography (CT) scan that disclose a high density hemispheric subdural hematoma (SDH) on the right side with SAH [Figure 1]. There was a filling defect between hematoma and cortex in the center of hematoma. There was marked mass effect with displacement of ventricular structures to the left side. The laboratory data including coagulopathy screen were normal. Because of the patient's critical situation, we decided on emergency craniotomy and removal of hematoma without performing angiography or CT angiography. In the operating room a large right side craniotomy has been performed. The dura was tense. After opening the dura, a thick subdural clot was removed. After hematoma removal, at the center of the field, there was a thick SAH and a vascular lesion at the center of SAH. By dissecting the arachnoid, the lesion was an aneurysm connecting to precentral artery by a neck [Figure 2]. Aneurysm was pulsatile with thin membrane and a small clot adherent to it indicating of recent hemorrhage. The neck has been ligated and aneurysm coagulated and removed. Dura has been closed with a pericranial patch. The bone removed because of the brain edema. Postoperative CT scan has shown reduction of mass effect without additional bleeding [Figure 3]. 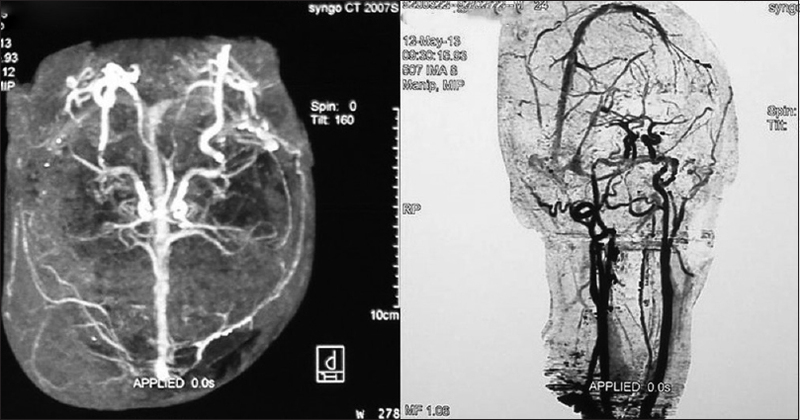 Postoperative CT angiography of cerebral vessels showed no vascular abnormality [Figure 4]. After 35 days of operation, the patient discharged with mild left side hemiparesis and dysphasia. Then he just has mild hemiparesis several months after admission. The occurrence of spontaneous ASDH is rare. Since the first report by Munro in 1934, many cases of spontaneous ASDH have been reported. In review of the literature there were total of 178 cases. The main causes involve aneurysmal rupture,,,,,,,,,,,,,,,,,,,,,,,,,,,,,,,,,,,,,,,, rupture of perisylvian cortical arteries ,,,,,,,,,, and tumors and neoplastic diseases.,,,,,,,,,,, Some other rare causes include moyamoya disease,, arachnoid cyst, dural cavernous angioma, dural arteriovenous fistula, myelodysplastic/myeloproliferative disorder  and polycythemia vera. The most common cause of spontaneous ASDH was aneurysmal rupture (135 cases about 75.8% of cases). 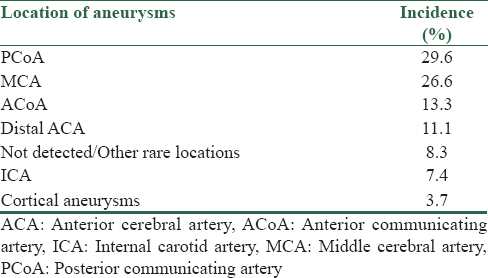 About 5 cases of aneurysmal rupture were cortical artery aneurysms in the territory of middle cerebral artery branches ,,, (3.7% of all aneurysms that caused ASDH). Other locations of aneurysms that cause ASDH and their incidence described at [Table 1]. The incidence of SAH associated with an ASDH due to rupture of intracranial aneurysms varies from 0.5% to 7.9%; however a pure SDH without SAH is extremely rare. Several mechanisms have been proposed to explain the occurrence of ASDH after aneurysmal rupture. Previous hemorrhage may fix an aneurysm to local arachnoid adhesion, resulting direct bleeding to the subdural space. Other causes may be due to hemorrhage under high pressure, leading to both pia mater and arachnoid rupture and extravasation of blood directly to subdural space. The other common cause for spontaneous ASDH was bleeding from perisylvian branches of middle cerebral artery ,,,,,,,,,, (29 cases about 16.2% of all cases). In this group of patients treatment with anticoagulant drugs as fondaparinux  and coagulopathy, cocaine use, hemophilia, systemic hypertension , were predisposing factors. Several authors have explained this mechanism of spontaneous ASDH. Vance found in his autopsies that small twinges connecting to the dura matter were identified that branched perpendicularly form the cortical arteries. As these twinges are torn by the shearing force, bleeding occurs and ASDH forms. According to Drake's report there were adhesions between dura matter and cortical arteries. Laceration of the adhesive arterial wall was caused even by trivial trauma resulting in bleeding. The points of rupture were always located at the branches in the territory of middle cerebral artery. Tallala and Mc Kissock reported that the causative mechanism of rupture of arteries was based on connections between the dura matter and arteries. Finally there were 14 cases (about 7.8% of all cases) of spontaneous ASDH due to tumors and neoplastic diseases.,,,,,,,,,,,,,,,, Intracranial and metastatic extracranial tumors with involvement of dura matter can cause ASDH. These cases include metastatic seminoma, meningioma,, metastatic lung cancer,, anaplastic astrocytoma of brain, choriocarcinoma, metastatic adenocarcinoma of prostate, chronic myeloblastic leukemia, malignant pleural mesothelioma, metastatic dural carcinomatosis  and paranasal sinus cancer. All of the metastatic tumors had involved dura matter and the origin of bleeding was venous. The choice of initial neuroradiological investigation in patients with spontaneous ASDH should be based on the neurological status of the patient. If the patient presented with stable neurological condition, angiography or CT angiography should be performed prior to surgery to dictate the best strategy. When an aneurysm presents, the patient should undergo emergency surgery to evacuate the hematoma and obliterate or extirpate the lesion. If the angiography or CT angiography does not demonstrate the source of bleeding, the patient can be managed conservatively or surgically according to the subsequent evaluation of the neurological status, if necessary, additional investigations with MRI can be performed to rule out tumors. In cases presenting with rapidly neurological deterioration, immediate decompressive surgery should be done before angiography or CT angiography. In the absence of intraoperative identification of cortical arterial rupture or other source of bleeding, complementary postoperative angiography or CT angiography is required. Ruptured cortical aneurysm should be considered as a cause of nontraumatic spontaneous ASDH. Angiography or CT angiography has to be carried out if the patient's clinical condition permits. Spontaneous ASDH and poor neurological condition dictates an emergent evacuation of hematoma and ligation of aneurysm. Follow up complementary investigations have to be done to examine any existing vascular anomalies. Hiramatsu K, Miyazawa T, Katoh H, Kohyama S, Tsuzuki N, Ishihara S, et al. Tiny aneurysms of cortical arteries presenting as an acute subdural hematoma: A case report. No To Shinkei 2001;53:84-6. Sung SK, Kim SH, Son DW, Lee SW. Acute spontaneous subdural hematoma of arterial origin. J Korean Neurosurg Soc 2012;51:91-3. Hori E, Ogiichi T, Hayashi N, Kuwayama N, Endo S. Case report: Acute subdural hematoma due to angiographically unvisualized ruptured aneurysm. Surg Neurol 2005;64:144-6. Rengachary SS, Szymanski DC. Subdural hematomas of arterial origin. Neurosurgery 1981;8:166-72. Munro D. The diagnosis and treatment of subdural hematoma: A report of sixty two cases. N Engl J Med 1934;210:1145-60. Marbacher S, Fandino J, Lukes A. Acute subdural hematoma from ruptured cerebral aneurysm. Acta Neurochir (Wien) 2010;152:501-7. O'Sullivan MG, Whyman M, Steers JW, Whittle IR, Miller JD. Acute subdural haematoma secondary to ruptured intracranial aneurysm: Diagnosis and management. Br J Neurosurg 1994;8:439-45. Westermaier T, Eriskat J, Kunze E, Günthner-Lengsfeld T, Vince GH, Roosen K. Clinical features, treatment, and prognosis of patients with acute subdural hematomas presenting in critical condition. Neurosurgery 2007;61:482-7. Kamiya K, Inagawa T, Yamamoto M, Monden S. Subdural hematoma due to ruptured intracranial aneurysm. Neurol Med Chir (Tokyo) 1991;31:82-6. Rusyniak WG, Peterson PC, Okawara SH, Pilcher WH, George ED. Acute subdural hematoma after aneurysmal rupture; evacuation with aneurysmal clipping after emergent infusion computed tomography: Case report. Neurosurgery 1992;31:129-31. Nowak G, Schwachenwald S, Kehler U, Müller H, Arnold H. Acute subdural haematoma from ruptured intracranial aneurysms. Acta Neurochir (Wien) 1995;136:163-7. Inamasu J, Saito R, Nakamura Y. Acute subdural hematoma caused by ruptured cerebral aneurysms: Diagnosticand therapeutic pitfalls. Resuscitation 2002;52:71-6. Krishnaney AA, Rasmussen PA, Masaryk T. Bilateral tentorial subdural hematoma without subarachnoid hemorrhage secondary to anterior communicating artery aneurysm rupture: A case report and review of the literature. AJNR Am J Neuroradiol 2004;25:1006-7. Kim JM, Hur JW, Lee JW, Kim MS. Acute subdural hematoma associated with ruptured intracranial aneurysm: Diagnosis and emergent aneurysm clipping. J Korean Neurosurg Soc 2005;37:375-9. Marinelli L, Parodi RC, Renzetti P, Bandini F. Interhemispheric subdural haematoma from ruptured aneurysm: A case report. J Neurol 2005;252:364-6. Koerbel A, Ernemann U, Freudenstein D. Acute subdural haematoma without subarachnoid haemorrhage caused by rupture of an internal carotid artery bifurcation aneurysm: Case report and review of literature. Br J Radiol 2005;78:646-50. Suhara S, Wong AS, Wong JO. Post-traumatic pericallosal artery aneurysm presenting with subdural haematoma without subarachnoid haemorrhage. Br J Neurosurg 2008;22:295-7. Nishikawa T, Ueba T, Kajiwara M, Yamashita K. Bilateral acute subdural hematomas with intracerebral hemorrhage without subarachnoid hemorrhage, caused by rupture of an internal carotid artery dorsal wall aneurysm. Case report. Neurol Med Chir (Tokyo) 2009;49:152-4. Kocak A, Ates O, Durak A, Alkan A, Cayli S, Sarac K. Acute subdural hematomas caused by ruptured aneurysms: Experience from a single Turkish center. Turk Neurosurg 2009;19:333-7. Marbacher S, Tomasi O, Fandino J. Management of Patients Presenting with Acute Subdural Hematoma due to Ruptured Intracranial Aneurysm. Int J Vasc Med 2012;2012:753596. Araki T, Sampei T, Murata H, Fujiwara H, Taki W. A case of internal carotid-posterior communicating artery aneurysm presenting pure acute subdural hematoma. No Shinkei Geka 2002;30:861-6. Blake G, James M, Ramjit C, Char G, Hunter R, Crandon I. Acute subdural haematoma without subarachnoid haemorrhage caused by rupture of an intracranial aneurysm. West Indian Med J 2003;52:80-1. Eggers FM, Tomsick TA, Lukin RR, Chambers AA. Recognition of subdural hematoma secondary to ruptured aneurysm by computerized tomography. Comput Radiol 1982;6:309-13. Friedman MB, Brant-Zawadzki M. Interhemispheric subdural hematoma from ruptured aneurysm. Comput Radiol 1983;7:129-34. Gilad R, Fatterpekar GM, Johnson DM, Patel AB. Migrating subdural hematoma without subarachnoid hemorrhage in the case of a patient with a ruptured aneurysm in the intrasellar anterior communicating artery. AJNR Am J Neuroradiol 2007;28:2014-6. Hatayama T, Shima T, Okada Y, Nishida M, Yamane K, Okita S, et al. Ruptured distal anterior cerebral artery aneurysms presenting with acute subdural hematoma: Report of two cases. No Shinkei Geka 1994;22:577-82. Inamasu J, Saito R, Nakamura Y, Ichikizaki K, Suga S, Kawase T, et al. Acute subdural hematoma caused by ruptured cerebral aneurysms: Diagnostic and therapeutic pitfalls. Resuscitation 2002;52:71-6. Ishibashi A, Yokokura Y, Sakamoto M. Acute subdural hematoma without subarachnoid hemorrhage due to ruptured intracranial aneurysm – Case report. Neurol Med Chir (Tokyo) 1997;37:533-7. Ishikawa E, Sugimoto K, Yanaka K, Ayuzawa S, Iguchi M, Moritake T, et al. Interhemispheric subdural hematoma caused by a ruptured internal carotid artery aneurysm: Case report. Surg Neurol 2000;54:82-6. Kondziolka D, Bernstein M, ter Brugge K, Schutz H. Acute subdural hematoma from ruptured posterior communicating artery aneurysm. Neurosurgery 1988;22:151-4. Williams JP, Joslyn JN, White JL, Dean DF. Subdural hematoma secondary to ruptured intracranial aneurysm: Computed tomographic diagnosis. J Comput Tomogr 1983;7:142-53. Nonaka Y, Kusumoto M, Mori K, Maeda M. Pure acute subdural haematoma without subarachnoid haemorrhage caused by rupture of internal carotid artery aneurysm. Acta Neurochir (Wien) 2000;142:941-4. O'Leary PM, Sweeny PJ Ruptured intracerebral aneurysm resulting in a subdural hematoma. Ann Emerg Med 1986;15:944-6. Onda J, Kodama Y, Emoto K, Yuki K. A case report of “pure” acute subdural hematoma secondary to ruptured intracranial aneurysm. Kyukyu Igaku 1989;13:631-4. Rengachary SS, Szymanski DC. Subdural hematomas of arterial origin. Neurosurgery 1982;8:166-72. Katsuno M, Murai Y, Teramoto A. Acute subdural hematoma without subarachnoid hemorrhage following rupture of a distal anterior cerebral artery aneurysm: A case report. No To Shinkei 2003;55:435-8. Satoh K, Sasaki T, Osato T. Intracranial aneurysm presenting as acute subdural hematoma without subarachnoid hemorrhage: Report of three cases. Hokkaido Brain Res Found 1999;8:27-31. Shinmura F, Nakajima S, Maruyama T, Azuma S. A case of ruptured middle cerebral artery aneurysm with acute subdural hematoma after clipping of the aneurysm nine years previously. No Shinkei Geka 1989;17:1175-9. Watanabe K, Wakai S, Okuhata S, Nagai M. Ruptured distal anterior cerebral artery aneurysms presenting as acute subdural hematoma – Report of three cases. Neurol Med Chir (Tokyo) 1991;31:514-7. Weil AG, McLaughlin N, Lessard-Bonaventure P, Bojanowski MW. A misleading distal anterior cerebral artery aneurysm. Surg Neurol Int 2010;1:55. Oh SY, Kwon JT, Park YS, Nam TK, Park SW, Hwang SN. Clinical features of acute subdural hematomas caused by ruptured intracranial aneurysms. J Korean Neurosurg Soc 2011;50:6-10. Gelabert-Gonzalez M, Iglesias-Pais M, Fernández-Villa J. Acute subdural haematoma due to ruptured intracranial aneurysms. Neurosurg Rev 2004;27:259-62. Ragland RL, Gelber ND, Wilkinson HA, Knorr JR, Tran AA. Anterior communicating artery aneurysm rupture: An unusual cause of acute subdural hemorrhage. Surg Neurol 1993;40:400-2. Boop WC Jr, Chou SN, French LA. Ruptured intracranial aneurysm complicated by subdural hematoma. J Neurosurg 1961;18:834-6. Naama O, Belhachmi A, Ziadi T, Boulahroud O, Abad Elasri C, Elmostarchid B, et al. Acute spontaneous subdural hematoma: An unusual form of cerebrovacular accident. J Neurosurg Sci 2009;53:157-9. Chhiber SS, Singh JP. Acute spontaneous subdural hematoma of arterial origin: A report of four cases and review of literature. Neurol India 2010;58:654-8. 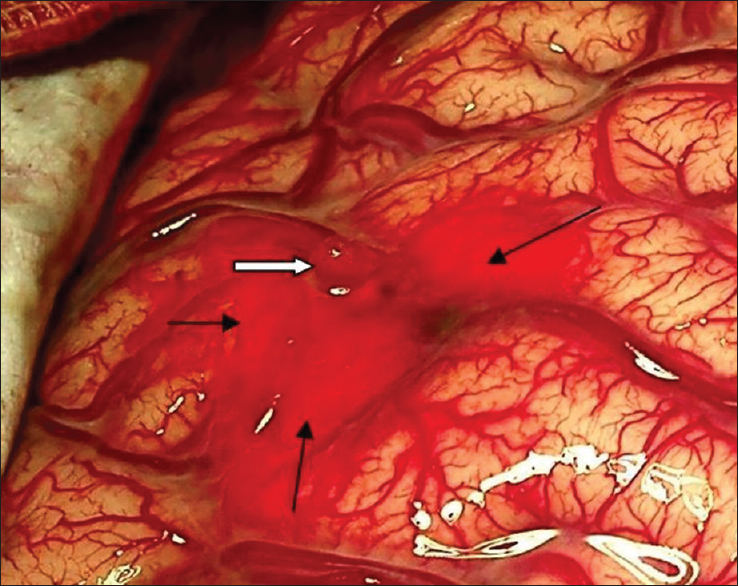 Alves OL, Gomes O. Cocaine-related acute subdural hematoma: An emergent cause of cerebrovascular accident. Acta Neurochir (Wien) 2000;142:819-21. Avis SP. Nontraumatic acute subdural hematoma. A case report and review of the literature. Am J Forensic Med Pathol 1993;14:130-4. Arai H. Acute hypertensive subdural hematoma from arterial rupture shortly after the onset of cerebral subcortical hemorrhage: Leakage of contrast medium during angiography. Stroke 1983;14:281-5. Vance BM. 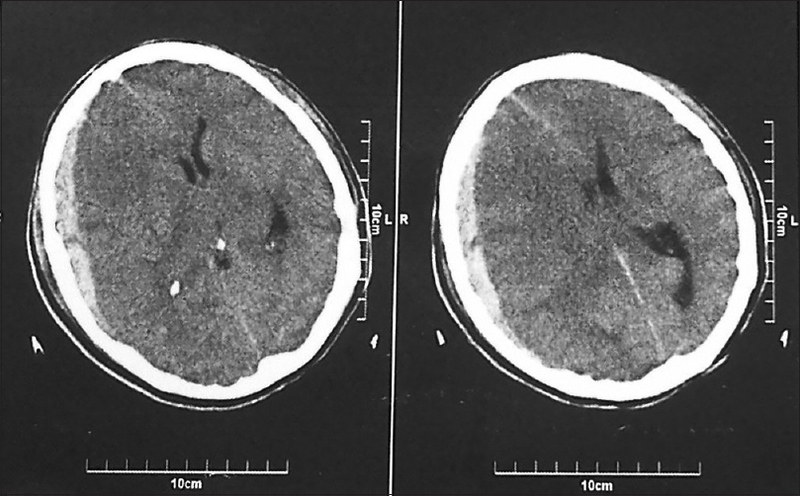 Ruptures of surface blood vessels on cerebral hemispheres as a cause of subdural hemorrhage. AMA Arch Surg 1950;61:992-1006. Drake CG. Subdural haematoma from arterial rupture. J Neurosurg 1961;18:597-601. Cave WS. Acute, nontraumatic subdural hematoma of arterial origin. J Forensic Sci 1983;28:786-9. Rouah E, Goodman JC, Harper RL. Acute subdural hematoma and metastatic seminoma. Neurology 1986;36:418-20. Deprez FC, Finet P, Raftopoulos C, Duprez T. Recurrent acute subdural bleeding as a rare complication of a hemorrhagic non malignant meningioma. JBR-BTR 2012;95:309-12. Lefranc F, Nagy N, Dewitte O, Balériaux D, Brotchi J. Intracranial meningiomas revealed by non-traumatic subdural haematomas: A series of four cases. Acta Neurochir (Wien) 2001;143:977-82. Zheng JX, Tan TK, Kumar DS, Lim LC, Loh HL. Subdural haematoma due to dural metastases from bronchogenic carcinoma in a previously well patient: An unusual cause of non-traumatic recurrent intracranial haematomata. Singapore Med J 2011;52:e66-9. Kuroki T, Matsumoto M, Kushida T, Ohtsuka T, Uchino M, Nishikawa H. Nontraumatic subdural hematoma secondary to dural metastasis of lung cancer: Case report and review of the literature. No Shinkei Geka 1994;22:857-62. Chrastina J, Novák Z, Riha I, Ghallab K. Primary brain tumor as a rare cause of acute subdural hematoma. Rozhl Chir 2009;88:549-53. Rocque BG, Baskaya MK. Spontaneous acute subdural hematoma as an initial presentation of choriocarcinoma: A case report. J Med Case Rep 2008;2:211. Bucci MN, Farhat SM. Metastatic adenocarcinoma of the prostate as a cause of subdural hematoma. J Urol 1986;135:803-4. Abdulhamid MM, Li YM, Hall WA. Spontaneous acute subdural hematoma as the initial manifestation of chronic myeloid leukemia. J Neurooncol 2011;101:513-6. Sato M, Saito T, Yamaguchi K, Sakuma H. A case of acute subdural hematoma due to dural metastasis from malignant pleural mesothelioma. No Shinkei Geka 1994;22:247-51. Hirashima Y, Kamiyama K, Endo S, Takaku A. Subdural hematoma due to metastatic dural carcinomatosis associated with DIC – A case report. No Shinkei Geka 1983;11:651-6. Nagayama I, Katoh H, Sakumoto M, Itoh M, Yoshida K. Subdural hematoma associated with dural metastasis from paranasal sinus cancer: A case report and review of the literature. ORL J Otorhinolaryngol Relat Spec 1993;55:240-3. Nakakita K, Tanaka S, Fukuda A, Fujii C, Kohama A, Miyasato H. Nontraumatic acute subdural hematoma caused by the rupture of transdural anastomotic vessels in moyamoya disease. No Shinkei Geka 1994;22:561-5. Shen WC, Lee WY. Moyamoya disease causes acute subdural hematomas and sudden death: A case report. Zhonghua Yi Xue Za Zhi (Taipei) 1998;61:619-23. Henriques JG, Pianetti Filho G, Henriques KS, Fonseca LF, Melo RP, Silva MC, et al. Spontaneous acute subdural hematoma contralateral to an arachnoid cyst. Arq Neuropsiquiatr 2007;65:1034-6. Suzuki K, Kamezaki T, Tsuboi K, Kobayashi E. Dural cavernous angioma causing acute subdural hemorrhage – Case report. Neurol Med Chir (Tokyo) 1996;36:580-2. Ogawa K, Oishi M, Mizutani T, Maejima S, Mori T. Dural arteriovenous fistula on the convexity presenting with pure acute subdural hematoma. Acta Neurol Belg 2010;110:190-2. Ichimura S, Horiguchi T, Inoue S, Yoshida K. Nontraumatic acute subdural hematoma associated with the myelodysplastic/myeloproliferative neoplasms. J Neurosci Rural Pract 2012;3:98-9. Sirin NG, Yesilot N, Ekizoglu E, Keles N, Tuncay R, Coban O, et al. A case report of cerebral venous thrombosis in polycythemia vera presenting with intracranial and spinal subdural hematoma. Case Rep Neurol 2010;2:37-45. Talalla A, McKissock W. Acute “spontaneous” subdural hemorrhage. An unusual form of cerebrovascular accident. Neurology 1971;21:19-25.